As you may of seen across our social media over November and December we produced our own Christmas jumpers and challenged ourselves to produce, market and sell them over a 4 week period. With it being a product with such a short sell by date we had to act fast and take it from concept to readily available online as quickly as possible. This journal post is a mini case study to break down our full process and hopefully outline how achievable it is to take a very simple idea, get it produced and start selling in around 3 days. This is by no means THE process, but we put our skills and knowledge into practise to make it work. We are much more than just a design agency, we are growth and sales driven so this task was something we felt we could really put our skills to the test. 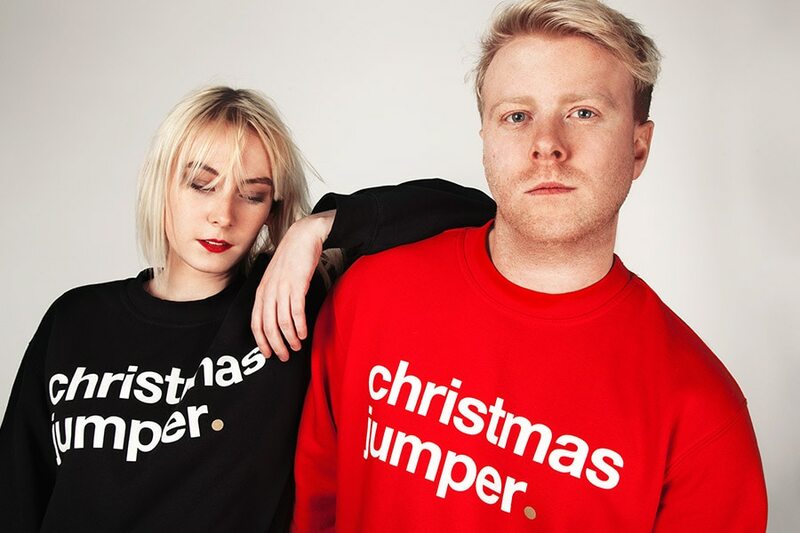 In the middle of November I had a really simple idea to produce Helvetica Christmas Jumpers – Literally that’s it! 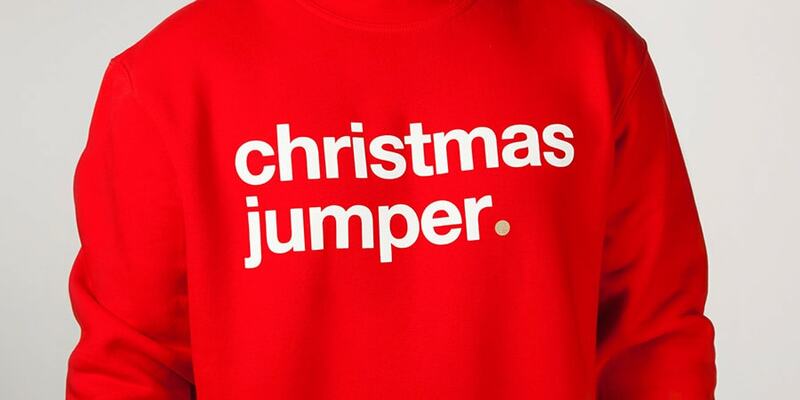 Jumpers which had ‘christmas jumper’ printed on the front. I kept seeing sparkly, over the top christmas jumpers with all the bells and whistles and thought ‘why don’t I strip this right down to the most simplistic it can be?’. A product aimed at bucking the trend and appealing to those who wanted ‘to be festive, but not THAT festive’ (and just like that, I had a product and a tag line). At this stage I genuinely had no idea if this idea was going to go any further than the pixels on my screen, I liked the idea but I had no idea if others would feel the same. I showed it to a couple of friends and family members and it didn’t seem like they really got it or at least it wasn’t the reaction I was hoping for. So after pretty disappointing feedback it looked like this idea was never going to see the light of day – shame! A day or so passed and I couldn’t stop thinking about this idea. I wasn’t fully confident in it, but it felt like it had potential and maybe I could make it work… I really wasn’t sure. I browsed the internet and couldn’t find anything similar – it was certainly different. Now with this uncertainty I really needed to pin point a target market and either set up focus groups to confirm the interest levels or at least go out and show it to people and record the reactions. The Christmas countdown was just around the corner, so I needed a quicker (yet measurable) solution to save time. I went on to my personal Instagram and set up a simple ‘yay or nay’ poll on my story. A really basic mock up of the jumper with the options to state whether you liked it or not over a 24 hour period. I said to my girlfriend that if too many people said no straight away I would delete the post and that would be that – no christmas jumper project this year! 30 minutes in and in came the ‘nay’s, not too many but they edged over the ‘yay’s – how embarrassing! At this stage I really started to question this idea and assumed I wouldn’t be going ahead with it. There was enough reason to leave the poll running as people started to say yes, so I left it to continue. A few hours later the yes’s started to pour in with only the occasional no (I was always aware that this wasn’t a jumper for everyone so I wasn’t offended by the those who weren’t a fan). I left the poll to run and throughout the 24 hours I started to receive messages from people saying that they wanted one and asking for PayPal details, so I decided to post it on Facebook to ask more people and measure more responses. Again, pre-orders and positive feedback started to pour in… In the time available, that was enough for me, and so it began! Decision made, let’s send this to print! I got into the office on Monday morning and showed the team and stressed that we needed to act fast (it was already mid November and at this stage all we had was a concept and a bit of feedback). I posted on social media that we were taking pre-orders at a slightly discounted price with FREE delivery (from past experience there is always a large number of enquiries and those who say they’d like one, but converting that into a sale is a different thing altogether). We were treating this almost like an ‘Apprentice’ challenge. That idea of coming together as a team and executing the whole ‘concept to market’ process in a very short period of time – a matter of days. We were going to put our skills and knowledge of marketing, design and branding to the test here with low budget and high pressure. – Order jumper samples: I wanted to check out as many jumper styles, options and colours as possible. I needed to be conscious of two things, price & quality. There were cheap options, but I wanted a well fitted, comfortable sweatshirt that people would enjoy wearing. I don’t like compromising on quality when possible. – Contact photographers: We needed content! We had mock ups of the jumpers, but it didn’t look real.. We needed to show real people wearing the real jumpers. Our go to studio / Photographer for this kind of job is The Raghouse Studio – Highly recommend! Holly understood what we were after and booked us in the following week. – Website: I didn’t want to bolt this webstore onto White Sky as I wanted to treat it like a very separate venture. White Sky being a branding agency and this product being a christmas jumper, I felt combining the two was too much and maybe a little confusing. – Order postage bags, tissue paper, swing tags etc – anything we would need to fulfil an order. We had a product, we had a plan of action, the main thing standing in our way from going to market was a website. With the time constraints there was no option to build a website from the ground up… That’s where simple template websites really come in handy and they’re so much more than just a quick fix. For this task we opted to go for Squarespace. We had used Squarespace in the past and never had any issues – it offered great freedom, was easy to use, the available templates were fresh and generally it had never caused us any reason for concern in the past – I was confident it would more than suffice for this task. Again, time was of the essence. Ed put together a quick and simple wire frame design and passed it on to Jordan to start putting together in Squarespace. Fortunately we signed up for the Squarespace new customer free trial period, so it gave us an opportunity to build our site and test it before committing to a monthly direct debit. This website needed to be simple. If anything, anything other than that would’ve damaged the whole idea around the brand and product – this was meant to be hilariously simple, no need to explain anything, no ‘about’ section, no team section… just a christmas jumper available in a few colourways. I wanted it to be sarcastic in tone and visuals. So by Monday morning the project had been given the green light and by the afternoon I think we could’ve been live and taking orders, but we had targeted a Wednesday / Thursday launch so I wanted to utilise the available time for linking payment systems, website testing and ensuring our squarespace and stripe settings were correct. I continued to organise samples, print and project planning, Jordan began to add a few details to the website and Ed started to produce content for the site, print and social media. Whilst lamenting in my luck, I clicked buy and entered my card details into the payment page. We had a product, a website and one of the most obvious domains available. It’s on auto-renewal if any of you are planning a November 24th domain steal by the way. From our personal social media accounts we were generating a good number of sales and started to sell out of some sizes. Word of mouth and unsponsored social media posts were proving to be successful, but we were always aware that there was a ceiling to the amount of sales this would generate and how far organic reach would go. Strangely enough a post on my LinkedIn page reached over 14,000 people organically and started to convert into direct sales, so I continued to promote on there. We still had White Sky to run, so I didn’t want get too caught up in this side project… but I couldn’t help but feel that there was more potential from this project. I contacted Rob Kimber from Cardiff who I felt would be great in managing the social media accounts and pushing the product on a national or even global scale. We work with social media daily, but with us having other work commitments I felt the social media needed more time and care than we could give it – to manage the ads and growth hacking would take time so Rob was brought in to do that. We gave Rob access to the website so he could add a Facebook Pixel and provided him with some simple content to start running some test ads. The original batch started to sell out fast, so we took a gamble and put in an order of 500 more jumpers… Did we have room for 500 jumpers? No. Had we planned the logistics of dealing with that level of orders? Absolutely not. However, fortune favours the brave and all that jazz, so we just had to get on with it. I’d be lying if I said I was completely chilled with ordering that amount… a few sleepless nights followed that week. A few people we know / work with who had a large number of followers on social media were kind enough to post them wearing the jumpers on their Instagram and Twitter accounts – this really helped us spread the word further and provided us with content to post on our own account. A special thanks to Gaz Oakley, Alana Spencer, Huw Stephens, High Contrast, Meggan Grubb, and Keshia, who all really helped us out – thank you all! Orders started to fly in and we were starting to wind up everyone in the Post Office self service queue. We couldn’t type in data for every single order one by one in the post office could we? It was taking too much time and becoming a daily task. Fortunately the good people at the Post Office offer a free service called drop and go. We signed up immediately and took away a few Royal Mail postage sacks. This meant that we could fill in a form as each order came in, package up orders as normal and add them to a large postage bag… Once a couple of bags were full we took them to the post office and left them by the counter. They just entered in our account number and took payment from our pre paid card – simple! It’s important to explore services like this to streamline the process as much as possible. When there are so many things that need to be considered to run a project like this, when there’s an opportunity to shave time off you need to take it! Mistakes… of course we made some. With us working so quickly I was expecting to, but it was a case of resolving them as quickly as possible and minimising the impact of these mistakes. One I really want to focus on is the one that frustrated me the most. If you’re planning a venture like this and you opt to use Stripe as your payment system this is a simple fix that could save you a lot of money. I didn’t realise that our payment settings were set to reject any card that wasn’t linked to the delivery / payment address – pretty much anyone who had a bank card registered at home, but were ordering to their university address for example would be rejected. After a fortnight I looked through our Stripe sales info and I started to see rejected order after rejected order – some customers were trying to order 3 jumpers at a time and trying 3-4 times before giving up. This along with our abandoned cart information didn’t seem to be available from Squarespace, so chasing up and correcting these potential leads proved difficult – I started to add up how much we were losing from this and contacted both Squarespace and Stripe immediately. Squarespace pointed me in Stripes direction and obviously Stripe pointed me right back in the Squarespaces direction and no one could give me a clear answer to what was going on. I looked into it myself and realised that the address situation was the problem, I’d had the same problem in the past trying to order football tickets, so it was suddenly clear that the same issue was happening here and by looking into the settings it was an easy fix. So we’re at risk of this journal entry going on a little, so i’m keen to wrap it up. So we streamlined our delivery process, we delivered most local orders by hand and offered a free pick up option on our website for any local orders (which people started to do). Our social media ads quickly started to convert into sales, so much so that we started to take orders from overseas – by the end we had sent out ‘christmas jumpers’ to over 10 different countries. We acted fast and of course we missed a few opportunities along the way – but it’s all a learning curve! Looking back at the project, of course it’s easy to go back over the costs and realise we could have saved money along the way, maybe we should’ve attended more Christmas markets, could we have contacted the university societies for sponsorship deals etc. Over all I’m pretty proud of what we could achieve in such a short period of time and I feel it proves that even the simplest of idea can have great potential. Whether it’s a full brand or if you have a simple design that’ll look great on a mug, a t-shirt, a shopping bag, anything… just go for it! We carried out this task as a side project and we achieved a global reach online. Our promotional techniques and content were simple, we just let the product do the talking and people seemed to get it. Through branding, design and social media we were able to start generating sales in a matter of days and continued to do so right up until Christmas. We are passionate about our creativity and ideas converting into growth and sales, we design for purpose and to make a genuine impact. With the success of this project, not only will we be adding more christmas jumpers to the site next Christmas, but we will also be exploring more ventures where we put our branding and social media skills to the test as side projects. White Sky – To the team. Ed and Jordan… Smashed it! Raghouse Studio – Holly at Raghouse Studio was fantastic and produced content for our website and social media. We’ve used Raghouse studio before and certainly will be again in the future. Bethanie Dwyer – Beth came to the office after work to count, sort and fold stock, help us fulfil orders, came with me on weekends to do local order drop offs, set up and worked at Christmas markets with me and generally just supported the whole project. Beth was the the packaging work force, the DPD driver, the sales rep and much much more – thank you Beth! Connor Simmons – Thank you Connor for tightening up the copy on the website. It was sarcastic, but not sarcastic enough until you took a look at it. Rob Kimber – Marketing and social media whizz Rob, cheers mate! Sam Taylor & Kate Hillard – Our models for the photoshoot! Thank you both. Visible Art – Cardiff based printing company. After our stock supplier let us down many times during this process, Visible Art saved our bacon and got us back on track! We’ve used Visible Art for years and they have never let us down. That Thing – Thank you to Bristol based clothing store ‘That Thing’ for stocking our Christmas Jumpers – If you’re ever in Stokes Croft in Bristol go check out the shop or shop online here.